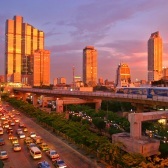 MKA Hotels is not holding any block space for Bangkok at this time. Below you will find a self-service booking site and you can make reservations on-line. Credit card is required to guarantee hotel reservation. For your convenience, our booking engine below has been set up in such a way as to display availability at hotels in close proximity to UNCC / UNESCAP first. You can also select the language of your choice to read the hotel information and make the on-line bookings.